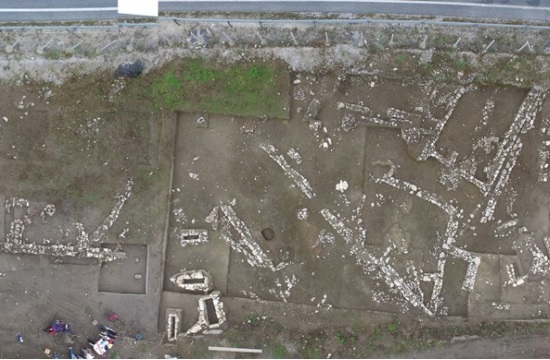 This excavation season completed the five year project of excavation research in the Bronze Age settlement at the “Asvestaria” site in Petroto, Trikala. The excavation is being carried out under Maria Vaiopoulou, archaeologist of the Ephorate of Antiquities of Karditsa, with the collaboration of an interdisciplinary team of researchers and the support of INSTAP. 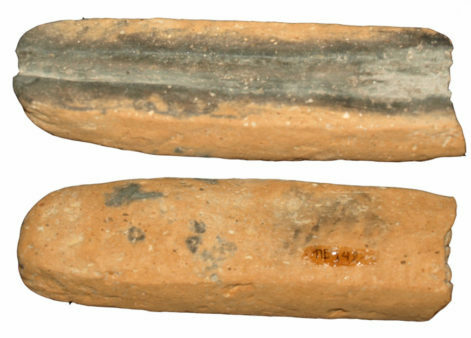 The dig at the “Asvestaria” site in Petroto, Trikala began as a rescue excavation due to the construction of the Larisa–Trikala national highway where a Late Bronze Age settlement came to light. The excavation research carried out during the five year programme provided interesting data on the settlement’s use of space over the centuries. Molds for metal casting (photo: Greek Ministry of Culture). The case of the Petroto settlement is the sole known example in West Thessaly of a Final Neolithic or even earlier settlement whose life continued uninterrupted to the end of the Bronze Age. During the excavation, parts of 14 buildings were unearthed which date from the EH II to the LHIIIC. One of the best preserved is Building H with a NE-NW orientation which dates from the LHIIIC. It is an arched building with an entrance on its northwest side and measuring 8.75x7m. Building E which dates from the LH IIIA is a large, rectangular building with three construction phases. A 16.21 m wall survives from the first phase, while a 12.22m wall remains from the second phase, where the building is found to be smaller. In the third phase, at least three spaces as well as a monumental entrance can be distinguished. The dimensions of the building in this phase are 16.21×5.60m. The building continues under the old Larisa–Trikala national highway. Building I which dates from the LHIIIB period, has a NW-NE orientation with the maximum remaining dimensions being 21.77×5.56m. It is made up of at least four spaces. On the north east side of Building I where its entrance is situated, a section of paved street came to light, 4.22m long and 2.40m wide, which covers building IB that dates from the LHIIB. During the excavations 42 burials came to light either in cist or pit graves that dated from the EHI to the LHIIIC, as well as a Roman pit grave with rich grave gifts, inside a layer of the EHIII. Some of the burials are exceptionally interesting such as that of a family (father, mother and infant) in a pit grave. Likewise, a burial came to light in a pit grave of a mother with an infant at her breast. In a box next to a child’s cist grave, among other grave gifts a dog’s skeleton was uncovered. As we know, dogs as grave gifts are often encountered in the Late Bronze Age. 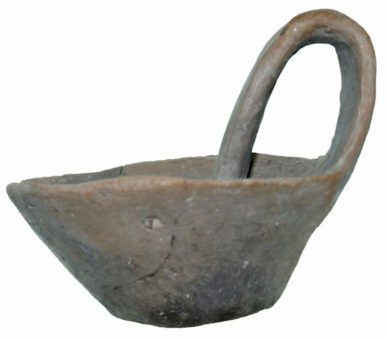 Ceramics from the excavation at the “Asvestaria” site in Petroto, Trikala (photo: Greek Ministry of Culture). 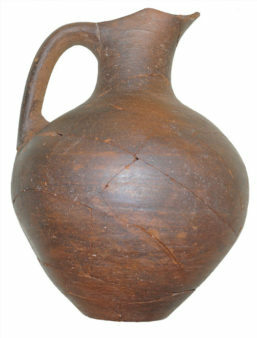 Apart from the discovery of locally produced ceramics, there was a significant number of “imported” vases from Argolis and Crete. 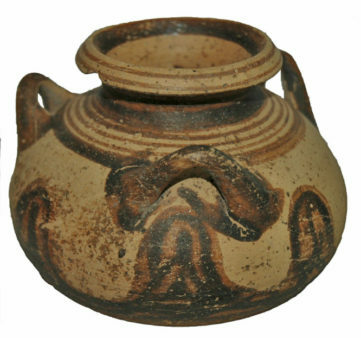 In the local ceramics of the LHX period which have their particular characteristics concerning the clay and the distinctive handles, the Middle Helladic tradition can be traced even in the shape of the vessels. 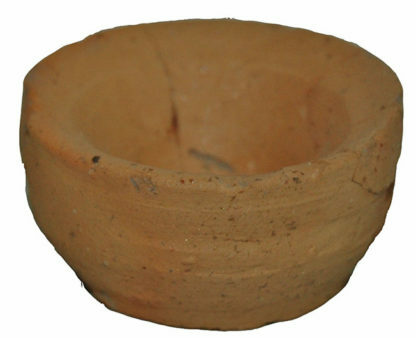 A large number of local ceramic vases mainly of the LHIIB period, imitate the ceramics of Argolis, using α dye in the coating which is similar in colour to the Argolis clay. 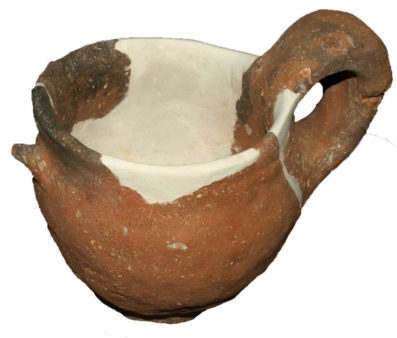 Most of these ceramics are also to be found in northern and western Greece and in Albania. Finally it is worth mentioning the presence of animal bones under the foundations of a building that dates from the MHX I (between 2134 and 1939 BC), which perhaps suggest a foundation ritual, along with the burial of a piglet located under backfills of the LHIIIA1 period.